CarGurus has 968 nationwide Boxster listings starting at $4,300. This year the Porsche Boxster will turn 20. It was back in 1996 that a new, midengine, convertible-only roadster joined the Porsche lineup with a starting price under $40K. At the time, the Boxster was truly a roadster. It was not optimized for track work, it was not a fast car for its price point, and it was perfect to almost anyone who ever drove it. For 2016, the new Boxster is optimized for track work, it is possible to spend about $100K on a Boxster, and it comes in four varieties. One thing that has not changed is that the car is perfect to almost everyone who has driven it. The convertible Boxster is a 2-seat roadster with the engine behind the passengers in the middle of the car, as opposed to hanging over the rear suspension as in a Porsche 911. This design offers the promise of perfect balance, something the Boxster delivers. Taken in the context of a convertible vehicle used for primarily pleasurable driving, the Boxster may be the perfect vehicle. Its legendary handling and its more recent performance credentials make it the favorite of many enthusiasts. Selected properly, the Boxster is also a fine track-day car, though the hard-top Cayman, which shares most of the Boxster’s design, may be the better racecar. The current-generation Boxster was released for sale back in the summer of 2012 and was designated the 981. The model saw significant upgrades and improvements, and the body became more modern and sleek looking. In particular, the side swoops in the doors that terminate in the engine vents became even more of a signature style feature. The twin rollover hoops behind the occupants’ seats are both functional and beautiful and add to the look of the car. Inside, the Boxster isn’t Spartan. A better way to describe the car would be uncluttered. The dash and center console seem to somehow have been made simpler for this car than in others. Everything you are looking for is there, including a navigation and infotainment system befitting a vehicle of this price point. The seats have the integrated headrests and simple yet functional style they've had since the beginning. There are four trim levels for the 2016 Spyder. Each has its own personality and mission statement. In addition to the standard Boxster and the slightly sportier Boxster S models that have been part of the line for decades, Porsche now also offers the Boxster in two high-performance trims above the S. First is the Boxster GTS. This is the high-output model for those who don’t want to make any sacrifices in their road-going pleasure. The GTS has a stronger engine and more performance bits we first saw on the Cayman, but nothing is missing. The Porsche Boxster Spyder is an even higher-performing car that has had some content removed to reduce weight. The Spyder is for track duty or those so serious about on-the-road performance they're willing to live with a manual soft-top, smaller steering wheel, and pull straps instead of door handles. One important thing to note about the Spyder: Air conditioning is not available. The Boxster’s mid-mounted engine is a boxer 6-cylinder, and there are no turbochargers involved in any Boxster. 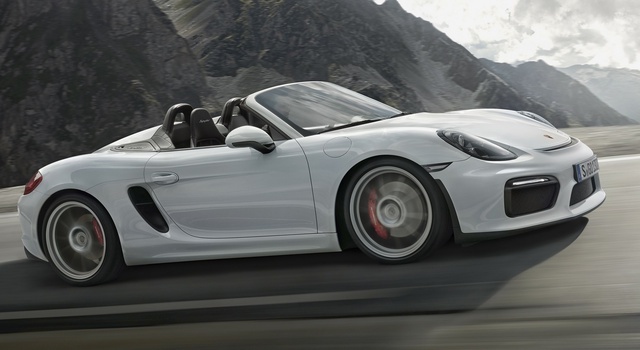 The base Boxster’s engine displaces 2.7 liters and has 265 hp, good for a 0-60 time in the high 5-second range. Next up the ladder is the Boxster S, with a 3.4-liter, 315-hp engine. It can hit 60 in 5 seconds flat. The GTS ups the power from the 3.4-liter engine to 330 horsepower, and it runs to 60 in about 4.7 seconds. All three of these models are available with either a manual 6-speed transmission or Porsche's dual-clutch automatic, which it calls PDK (Porsche Doppelkupplung). The Porsche Spyder was revealed recently, in April 2015. It has a body style slightly different than that of the other three Boxster trims. It has Speed-Racer, Mach5-style humps behind the headrests and front and rear fascia it shares with the GTS. In the Spyder, the 3.4-liter engine is tuned to 375 hp, and the car can rocket to 60 mph in the low-4-second range with its 6-speed manual, the only transmission. The base 2016 Porsche Boxster “starts at” about $53K. The S starts at $64K, the GTS at $75K, and the Spyder at $82K. Add at least $5K for options in any model. Go full-in on the options page, and you could add much more. In terms of safety, it's important to remember this is a specialty car. IIHS has not tested the Boxster, so we don’t have a good basis for comparison. Run off of a racetrack or in a minor accident, the Porsche Boxster is as safe as any small convertible, or better. However, in a real-world crash head on with another car or utility pole, it's important to remember where the car’s engine is located. What's your take on the 2016 Porsche Boxster? Users ranked 2016 Porsche Boxster against other cars which they drove/owned. Each ranking was based on 9 categories. Here is the summary of top rankings. 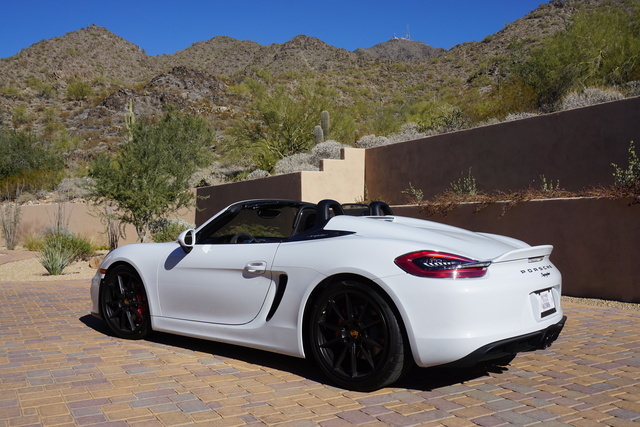 Have you driven a 2016 Porsche Boxster?